Home Elliptical Trainers Under $2000 * Comparison & Reviews (2018-2019) – This is a roundup, comparison and reviews of the best rated elliptical trainers under $2000 dollars and higher than $1000. These are the high end elliptical trainers. They differ from the less expensive machines in that they weigh more, have more features, can handle heavier user weights, are better built, and generally longer warranties. Elliptical Trainers provide an excellent form of aerobic exercise at home that you can do no matter what the weather is outside. Elliptical machines are easier on your joints than other forms of cardio exercise. These low-impact exercise machines also build arm and leg strength. You can compare each elliptical trainer below by features such as workout programs, reviews, maximum weight capacity, price, and other features. A glossary of terms is available at the bottom of this page. 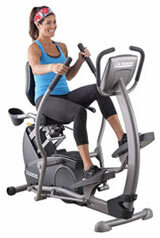 Maximum User Weight = Each elliptical trainer depending on its construction has a maximum user weight limit. More expensive trainers generally can handle more weight. So if the limit is 300 lbs, and you are over 300 lbs., you should not buy this trainer but look for one with a higher weight limit. If you weigh substantially less than the weight limit, this will put less strain on the machine and parts. ECB Resistance = ECB Resistance is a high quality form of magnetic brake resistance. ECB = eddy current brake. Telemetry Enabled = Wireless enabled. A polar type chest strap can be used, but is not included. Variable Strd = This refers to an elliptical machine that has a varible stride. It will list the inches of the stride (example 2 – 26″). This means that you can adjust the stride yourself and is not fixed. LED/LCD Display = The elliptical trainer will have a display to give you information (such as time, calorie burn, distance). They can be either LED lit, or use an LCD screen. Many ellipticals have LCD screens that are not backlit, as many run on batteries. If its says “BACKLIT LCD”, then it has a backlight illuminating the screen. LED displays are illuminated screens. Power Incline/Incline Ramp = Some Ellipticals have an incline ramp which can allow you to simulate hills and make your workout harder.